Pour the coconut rum and peach schnapps into a glass with ice. Fill it with pineapple and add the splash of grenadine. 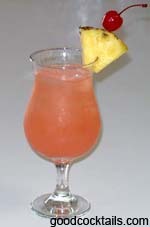 Some bartenders use Dark Rum instead of the Coconut Rum.